It starts with your free SANGKRIT.net account, once your account is registered simply set your homepage to system.sangkrit.net and start promoting your business, (see how). During the initial stage of your business, you may target the manufacturers, vendors, and suppliers to explain to them the importance of online selling from their own e-commerce website and app. You may also target individuals, professionals, and housewives to explain to them the importance of blogging and how it can help them to make money from home by investing their time on their domain. Signup for your free SANGKRIT.net account to start making websites and apps for yourself and others as well. Read the book #OccupyWebspace on your android phone from Play Store. Download android app Shardul Pandey from Play Store to connect direct with System Administrator. SANGKRIT.net lets you work for yourself across all countries alike. 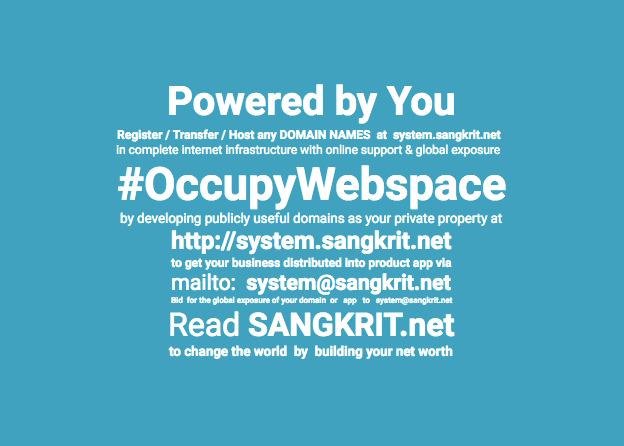 Signup for your free SANGKRIT.net account to startup. Wherever you are, you work by helping people around you in bringing their business online. Doing that you become the people’s personal outlet delivering complete internet infrasructure, online support and global exposure to them then and there. You do great business as bringing everybody’s business online, is going to become the greatest ever business. You are always prepared for developing any websites or apps for others because independent developers, from around the world, help you in doing that and whomsoever you show the path of getting emplyed like this, bring you increasingly more business. Accordingly you pay them fellowships for any cooperation in innovation and promotion. The work goes great. You help humankind in upgrading life and business as per the standards of the smartphone stage of internet age and from every corner of the planet Earth, the work comes looking for you upon your personal app.